I love going down to Melbourne, for a host of reasons. The main reason is to visit family, but my brother and I have a shared love of cycling. I have ridden with him and his riding crew quite a few times, and this weekend just gone gave me another opportunity to indulge in our shared passion. But best laid plans came undone from the time I touched down. No QANTAS didn’t lose my bike, but my brother was suffering from a serious case of man-flu – enough to keep him off the bike. So it would be me riding solo to meet up with his riding crew. I knew that riding in Melbourne would require me to come prepared. This meant thermal tights and lots of layers. I was just hoping for little wind and no rain. Little did I realise that the city was experiencing its coldest weather spell of the year. Saturday morning and I was up at 6:15 to suit up for the ride. Did I say it was cold? Light on, liquid bottled, layers on, I stepped outside and BAM – it was 0 degrees Celsius (32 degrees Fahrenheit). It was bloody cold. The normal gradual warm up for the first few kms was thrown out the window, I was spinning 110 rpm just to get warm. 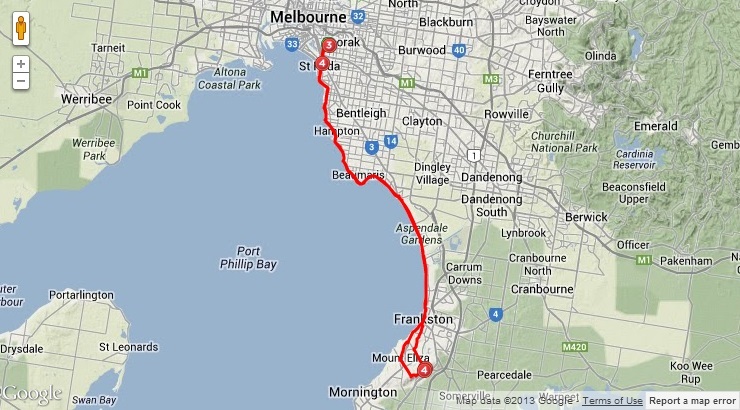 By the time I got to Beach Road (about 8km from my brother’s house), my average speed was up over 33kph. I couldn’t feel my toes, it was soooo cold! Getting to Beach Road on the weekend is always a sight. Waiting for the lights to turn green I estimated that at least 200 cyclists had ridden through the intersection in both directions. There wasn’t an event on, this is just Melbourne on the weekend – Australia’s home of amateur cycling. I would eventually ride past thousands of cyclists on this trip, and it makes you happy seeing so many people enjoying their two wheel freedom. They have even implemented a clearway on both sides of the road on the weekend mornings in acknowledgement of all the two wheel traffic. I rode the further 8km to Black Rock to rendezvous with my brother’s riding crew. First up was Mark and his wife Leslie, joined by their friend Darren who I would ride with for the first time. Darren had just acquired a new BMC Racemachine RM01 – SWEET! Next came Big Dave, who is always good for a laugh. He proceeded to remark that he thought he looked like Robin Hood in his winter tights and that it was so cold he nearly grabbed his skis instead of his bike. Next came Pete who had been off the bike for some time since his big ride on the 3 Peaks challenge. Last to arrive was Tall Dave, on his custom Ridley uber fast bike. One of the other regulars, Pete’s brother in-law Carl, had already set off to do some “secret training”. The group was assembled and we weren’t getting any warmer so off we went. It was good to catch up with the crew most of whom I hadn’t seen in a long time. Normally we have Big Dave’s wife Sue riding with us too, but she had succumbed to an injury with her hamstring. Bad enough to have her seeing an osteopath for treatment and no chance to go out for a ride. I have to admit that both Sue and Leslie are pretty impressive on two wheels. If we keep a pace no more than 30kph (18 1/2 mph) they can keep pace with us the whole way. I got the chance to chat with all the crew and catch up on what I had missed. They proceeded to tell me that my brother has been conspicuously absent from the weekend rides of late, so much so that they suspect that he has a mistress named Donna (which is a mis-spelling of doona, the Aussie word for duvet or quilt, which he has used as the excuse for being under rather than on his bike). I asked Mark where we were headed and he told me Two Bays. A quick calculation in my head, and I figured that I might be on a century ride for the day – cool. The ride to Two Bays involved riding down to Frankston and then climbing up the hills in the back country to get to Mt Eliza. The climbing was decent enough to challenge us, and I wanted to lead out as much as possible. Up the first steep incline, Mark wanted to show off his new Look bike and put the hammer down to go past me. Tall Dave followed him up, coming alongside of me. As we neared the crest, Tall Dave turned around at the same time as Mark began to peter out. Their wheels overlapped and then Tall Dave touched his front wheel against Mark’s rear. It all happened in slow motion in front of me, and Tall Dave nearly caught it but had lost too much momentum and went down. This triggered off a set of events that would unfold later in the day – but we were not to know at the time. Tall Dave had gone down reasonably hard on the palm of his hand – he is tall after all and fell from a greater height than I would have. He also bashed up his elbow, and his knee was letting out a bit of Claret. But he told us he was alright and he rode on gingerly never getting to the front again. We continued riding up the hills and Mark was telling me about the virtues of his new Look machine. It was at this point I heard someone yell out, “C’Mon Boys, get moving!” It was Leslie. Yes the sole lady rider in the group laid down the gauntlet. So off I went. I pulled up a few kilometres up the road to allow everybody to regroup and continue on to Mt Eliza together. As we came up to the roundabout with Two Bays Road we saw Carl returning from his secret training run. He proceeded to swing around and join us and it was great to see him again too. I had a bit of a chin wag with him too on his Specialized speed machine. His brother in-law Pete came up behind me and told me to get on it again, but for a different reason – Carl’s only Strava KOM was on that stretch of road and he wanted me to go for it. But Carl took off like a bat out of hell and it was not going to be. My favourite part of this ride is the descent down Canadian Bay Road back to the Nepean Highway – it is a long descent with a left-right chicane down the bottom that reminds me of “Eau Rouge” at Spa-Francorchamps Race Course in Belgium. This was only the third time I had ridden this descent, so I didn’t go full belt and followed Pete who is a crazier downhill rider than I am. Getting back to the Nepean Highway we pulled up for a coffee at around 60km into my ride. This was needed as we were still in the throws of some very cool temperatures. Did I say it was cold? I tried to wolf down my carbohydrate muesli bar, which was so cold that it was as hard as a toffee. We couldn’t have drunk our coffees any quicker because we needed to get back on the bikes to keep warm. A quick diversion down Old Mornington Road gave the guys another opportunity to stretch out their legs on one of their favourite descents, before we returned back to the Nepean Highway. My second favourite part of this ride is the downhill bombing of Oliver’s Hill where I always clock over 60kph. Back at Frankston, Tall Dave pulled the pin complaining of a sore neck. This was the second indication that things were not right for him. He gave his wife a call and told us to ride one because she would come and pick him up. We rode back at pace, and the weather was finally becoming perfect. The bay was flat as a tack, no wind, and the mercury was creeping back up over 7 degrees Celsius on its way to the 11 degrees that it would hit at the end of the ride. I stayed on the front setting the pace up around 33-35kph and I felt very strong. I looked back a couple of times to see that I was leading out a longer train with a few other groups tacking onto my tail. That was cool by me, because I was feeling strong. Gradually the rest of the crew all ducked off to their respective home destinations and I left Mark, Leslie, and Darren as the last ones as we neared Black Rock. They wanted a second bout of coffee, but for me I wanted the century. The remain 16kph I rode mostly at my own pace solo at or around 30kph. Glancing down at my Garmin I was keeping 28.5kph (about 17.7kph) for the whole ride, and I just wanted to maintain that pace. The challenge was going to be all the intersections and now busy Saturday traffic coming back into the city. But as I went through St Kilda on the way back to South Yarra I jumped back on the pedals and hammered it back to my brother’s place. Rounding the corner into his street ticked over the century mark at 100.1km. I felt very strong throughout this ride and was quite chuffed, and hungry, by the end. This is the second century ride that I have done in as many months but this one was definitely quicker and stronger. Now I have to maintain this base and build on it through the rest of the winter so I come into September with good lungs and legs. BTW – the average temperature for the whole ride ended up being 4 degrees Celsius. Here is the route that my Garmin captured. As for Tall Dave his fall might have been a small blessing. He went to the hospital to get checked out thinking that the accident, and it was a genuine accident because these guys are an experienced and safe bunch to ride with, might have caused his neck aches. The diagnosis was a lot more serious than we could have imagined. He had an aneurysm developing at the base of his skull. He was moved straight away to the best hospital in Melbourne, but we are all concerned with the seriousness of his condition. They have not operated on him yet, and will be conducting an angiogram tomorrow to determine the extent of the condition. It would appear that this had been developing for some time. My brother, the rest of the riding crew, and I are all concerned about what happens next. I could write something flippant like “hope he gets back on the bike soon” but I know how serious this is – and it is not about the bike. The good thing is they have detected it now and he is in good hands. I love riding and travelling, but I also like life and want my friends to remain healthy to enjoy their lives too. All the best to Tall Dave! Thanks. Will pass on all well wishes. It is so strange to read your description of the cold weather there when it is summer now here. I hope your friend returns to health soon. Well Winter Solstice has just gone, so by my reckoning the days are getting longer and Summer is on the way! Hopefully.